Photograph of the small Buddhist vihara, Cave 19 at Bhaja, Pune District, taken by Henry Cousens around 1880, from the Archaeological Survey of India Collections. At Bhaja, south of Karli, there are more than twenty rock-cut Buddhist monasteries from the Satavahana period. The vihara or monastery Cave 19 was excavated in the 2nd century BC. 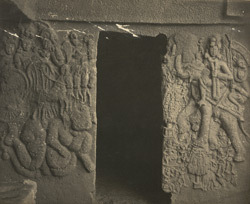 On the sides of the doorway leading to the cell at the right of the verandah there are large sculptures which are among the earliest examples of figural art in India. The sculpture on the left depicts the god Surya on his chariot pulled by four horses who are trampling on a demon. On the right there is the god Indra on his elephant with an attendant, carrying a banner and spear.